You might say that our roots lie in serving the agricultural population. In 1989, we were founded as the Finger Lakes Migrant Health Care Project, Inc. Our mission was to make quality healthcare accessible to a population that was “invisible” to the system—migrant farmworkers and their families. Ag workers are men, women, and children. 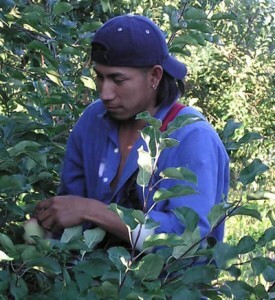 Few people realize that agricultural work is one of the most dangerous occupations in America. Farmworkers are at risk for accidents from machinery or farm animals, poisoning from pesticides, and overexposure to harsh weather. They are not protected by sick leave and risk losing their jobs if they miss a day of work. Agricultural workers are not only women and men but many are children as well. Our main challenge was to overcome the barriers that foreign-born, seasonal workers often experience in seeking care. Cultural and language differences, lack of transportation, and deficient health insurance often discourage them from seeking help. Patient Navigators will help you understand the healthcare system and connect you with the right resources. Using our Electronic Health Records system (EHR), they have all your information right at their fingertips to help with forms, referrals, appointments, and billing. Our Community Health Workers work in conjunction with primary care providers to coordinate services as their patients move through the healthcare system. We become familiar with each patient’s lifestyle, work habits, culture, and belief systems. This enhances the patient/provider relationship and minimizes miscommunication. Community Health Workers also help patients with appointments and referrals and connect them to additional community support such as churches, businesses, and human services agencies. They also educate patients on ways they can adopt a healthier, self-reliant lifestyle. Not having transportation makes it difficult for many agricultural workers to get to our health centers. Our strategy? If the patient can’t come to us, we’ll go to them. Through this award-winning program, traveling medical teams visit the housing sites of agricultural workers. Consisting of a medical provider and a bilingual Community Health Worker, the teams provide triage, screening, routine care, referrals and if needed, transportation to the nearest FLCH health center. They also seek out isolated pockets of agricultural workers, informing the farming community of the services available. The Mobile Dental Program provides preventive and routine dental care to the children of agricultural workers. An FLCH dental team visits children in designated Agricultural Head Start Centers and Agricultural Education Tutorial Program summer school sites. A dentist and hygienist then provide a full range of dental services in a stress-free atmosphere. We also coordinate with the Eastman School of Dentistry to give dental specialty services via Telehealth’s teledentistry technology.